Core to the family of energy loss techniques is spectroscopy. Here the analysis of the energy distribution of the electrons is used to determine the local properties of a specimen, including: the type and quantity of atoms present; bonding and chemical state of atoms; and the collective interactions of atoms with their neighbors. 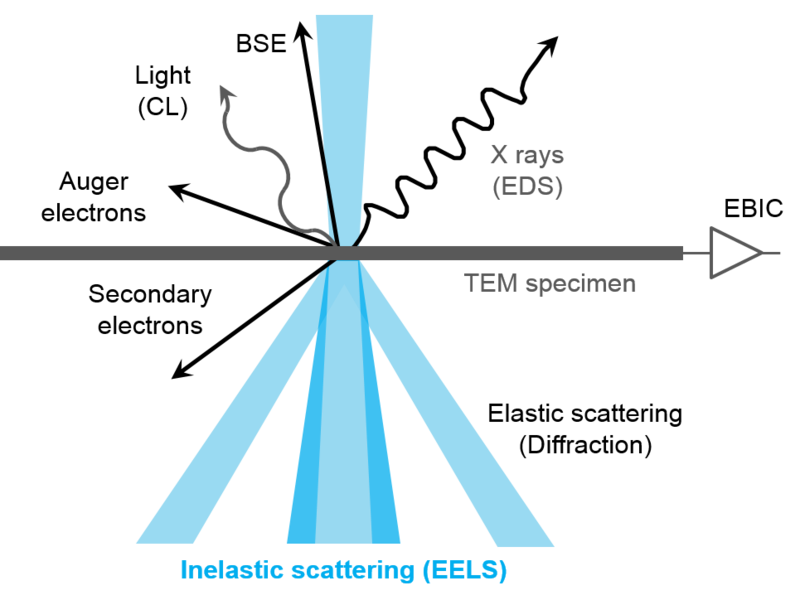 Transmission electron microscope (TEM) specimen beam interactions. As electrons pass through a specimen, they interact with the atoms present. Many of the electrons pass through the thin sample without losing energy. While a fraction will undergo inelastic scattering and lose energy as they interact with the specimen. This leaves the sample in an excited state. The material can deexcite when it gives up energy typically in the form of visible photons, x-rays, or Auger electrons. Atom-scale view of electron energy loss in TEM. As the incident electron interacts inelastically with the sample, it changes both its energy and momentum. This scattered incident electron is detected in the spectrometer and gives rise to the electron energy loss signal. The sample electron (or collective excitation) carries away this additional energy and momentum. Core-loss excitations occur when tightly bound core electrons are promoted to a higher energy state by the incident electron. The core electron can only be promoted to an empty state in the material. These empty states can be bound states in the material above the Fermi level (so called antibonding orbitals in the molecular orbital picture). The states can also be free electron states above the vacuum level. It is the sudden activation of the scattering at the Fermi energy and the probing of empty states that makes the EELS signal sensitive to both the atom type and its electronic state. Correlation between EELS and specimen features. You can visualize the initial spectral features in the core-loss excitations by aligning the Fermi level with the zero-loss peak (ZLP) of the spectrum. Edges can now be seen as the point where the electrons lose enough energy to promote the core level atomic electrons to the Fermi level. This analogy fails to reproduce the scattering above the Fermi level, but is useful to visualize the core level edge sudden increase in intensity. The three regimes of an energy loss spectrum. A typical energy loss spectrum includes several regions. 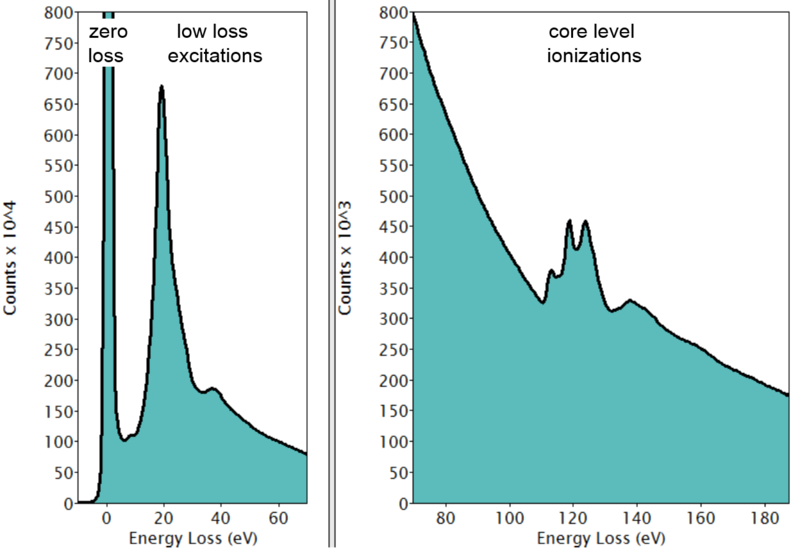 The first peak, the most intense for a very thin specimen, occurs at 0 eV loss (equal to the primary beam energy) and is therefore called the zero-loss peak (ZLP). It represents electrons that do not undergo inelastic scattering, but may be scattered elastically or with an energy loss too small to measure. The ZLP width mainly reflects the energy distribution of the electron source. It is typically 0.2 – 2.0 eV, but may be as narrow as 10 meV or lower in a monochromated electron source. ZLP and low-loss signal scattering distribution obtained via Fourier-ratio deconvolution. Following the ZLP, other low-loss features arise from inelastic scattering by conduction or valence electrons. This scattering regime can be related to optical excitations of the material and other collective excitations such as plasmons. The next regime includes core level excitations. 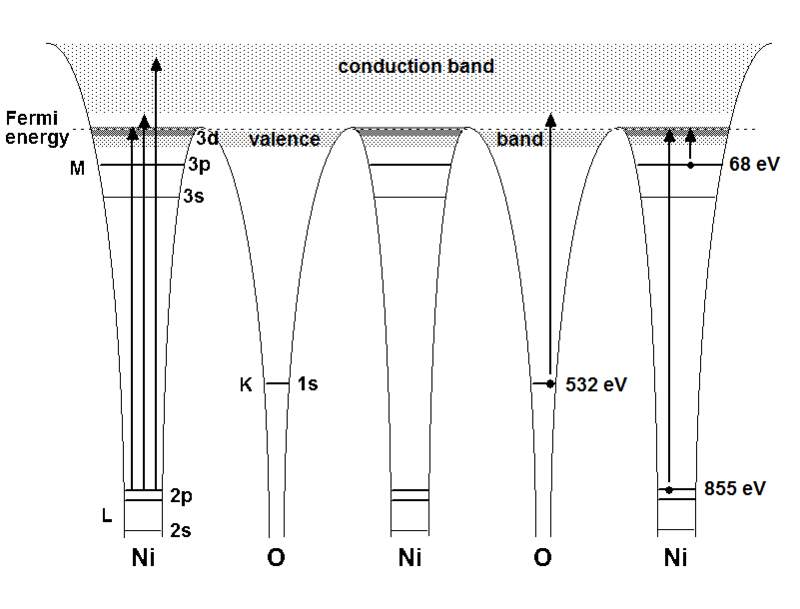 This regime arbitrarily starts at ~100 eV loss (but can be lower for states near the conduction band) and extends all the way to the primary beam energy in principle. In practice, energy losses above 5 kV are difficult to measure. 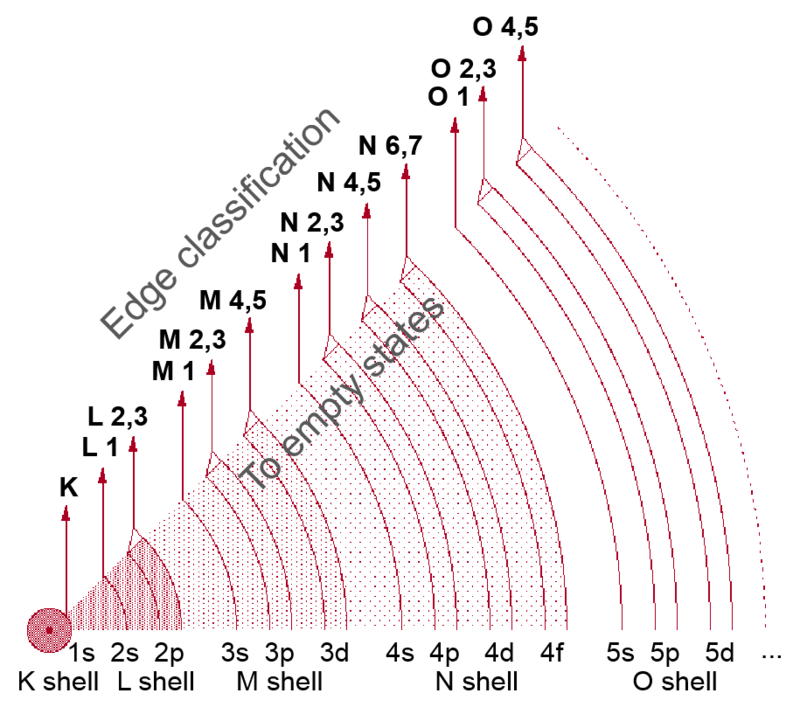 Since core electron binding energies differ for each element and each type of shell, the ionization edge threshold can be used to identify which elements are present in the specimen while you can use the edge intensity to determine the element concentration in the sample. Core level ionization edges – The edge onset energy determines which element is present while the intensity above the background is proportional to the number of atoms the beam interacted. Nomenclature of inner shell ionization edges (After Ahn & Krivanek, EELS Atlas). Egerton, R. F. Electron Energy Loss Spectroscopy in the Electron Microscope. Springer. 3rd ed. New York: 2011.